Designed for caregivers of special children, this humorous, heartwarming 90-minute workshop is based on the best-selling book, Shut Up About Your Perfect Kid! A Survival Guide for Ordinary Parents of Special Children. Using hilarious anecdotes and fun exercises (no Spandex required), the sisters will show attendees how to let go of the expectations they have for their children and embrace the reality. For parents of special children, advocating for school services can be a stressful experience. In fact, in an imperfect study conducted on shutupabout.com, 9 out of 10 parents indicated they would prefer a colonoscopy to a parent/teacher meeting. Patty and Gina offer a more pleasant alternative: an informative, interactive two-hour workshop that helps bridge the gap over the IEP table. Included in this workshop is a discussion based on the Sisters’ enlightening Youtube Video, The IEP Team Meeting, which is used as a teaching tool at Loyola University and other colleges throughout the country. ** This presentations has been used for Professional Development at public, private, and special- needs elementary and secondary education schools. The path to accepting people with differences and imperfections begins and ends with children. In this fun and informative workshop, Patty and Gina will teach middle school and high school students how to look beyond the differences of others. Using funny stories that children can relate to and video footage of disabled students who have achieved success, the Sisters will have typical and special children laughing and celebrating differences, including their own. For Corporations: Laugh, Lunch, and Learn. Adults living with visible and invisible disabilities are in our schools, communities, and in our workplaces. Whether you have a co-worker in a wheelchair or one that exhibits social quirkiness, this workshop will help your employees appreciate and understand the differences of others, while promoting collaboration and productivity. In this highly successful workshop, which was implemented by Raytheon Corporation. Patty and Gina share their wisdom as well a lunch snacks. NOTE: Twinkies and Ring Dings will no longer be a menu option. With its health benefits, laughter is truly the best, most affordable medicine (no co-pays required). 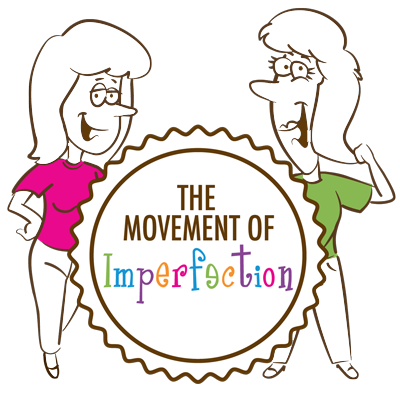 Use it to liven up your next conference or charity or other event with Patty and Gina’s 7 Habits of Highly Imperfect People. From imperfect parenting and housecleaning to marital mayhem, the Sisters will have your attendees roaring with laughter.